Inspired by Board Games with Scott's episode on poker chips, and by the generally low quality of chips that friends of mine own, I have embarked on a project to identify and acquire some higher quality chips that will be nicer to use. Since Scott's episode is over five years old now, I decided that some follow-up investigation would be useful to see what has changed since then. The good news is that most of what he says still holds true, down to the names and descriptions of common varieties of chips. I play games such as poker where one's chip stack is public knowledge, as well as games such as Illuminati where it is not. For either type of game, I want chips that sound and feel good. They should not have metal coin inserts which clang; they should stick together and stack well; they should be uniform in appearance and manufacture; they should be of standard size and reasonable weight. Beyond those shared considerations, the qualities of an optimal chip will vary between these two game types. 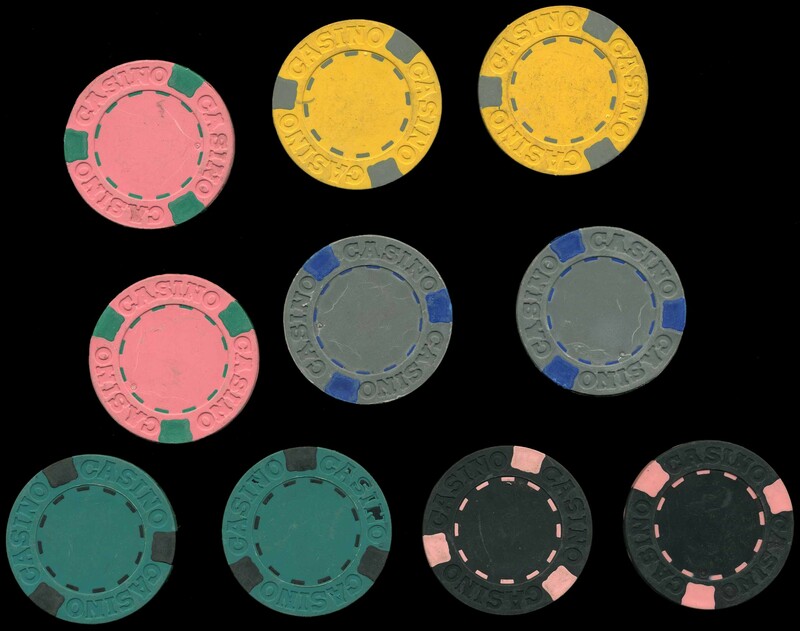 Chips for public-knowledge games should be non-denominated so that their values can be assigned on a per-game basis, and should have clear edge colors so they can readily be distinguished in a stack. 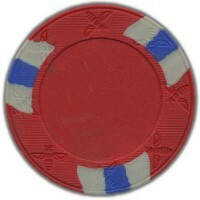 Chips for private-knowledge games should be denominated on the face but indistinguishable from the side. Rather than purchase sample sets from the various manufacturers, I found a website that would sell me individual chips, from which I built my own sample sets. For about US$20, I got roughly 60 chips belonging to eight different chip lines ranging from 6 cents to about 50 cents apiece. 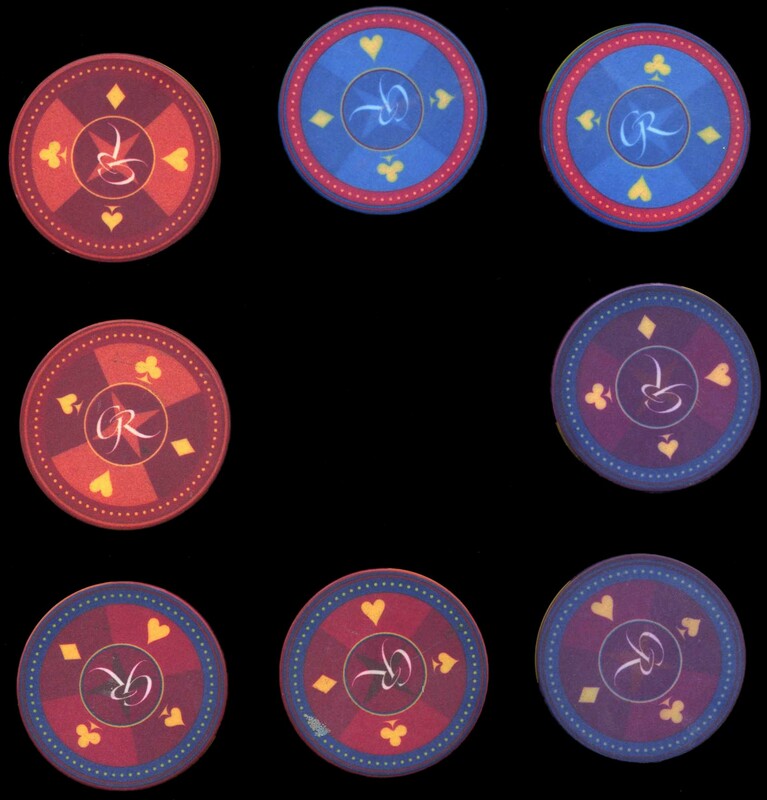 The more expensive chips had unavoidable qualities I did not want: large, distracting edge spots, denominations, or unwanted graphics advertising one casino or other. My chips arrived loose in a bubble padded bag, which provided a free bit of life testing as the chips were banged together by package handling equipment in shipping. The cheap plastic chips held up very well to this level of abuse, as did the ceramic chips at the higher end of the price range. The clay composite or faux clay chips in the 20-30 cent range did not fare so well, being readily marred by other chips, and by marring the other chips they came into contact with as well. The cheap chips I purchased are the Monaco chips and the suited chips, both findable with online searches of those terms, at 6 cents apiece. 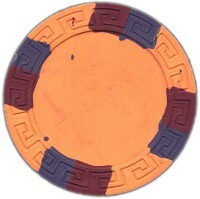 They both have metal coin inserts and are available in bright colors. 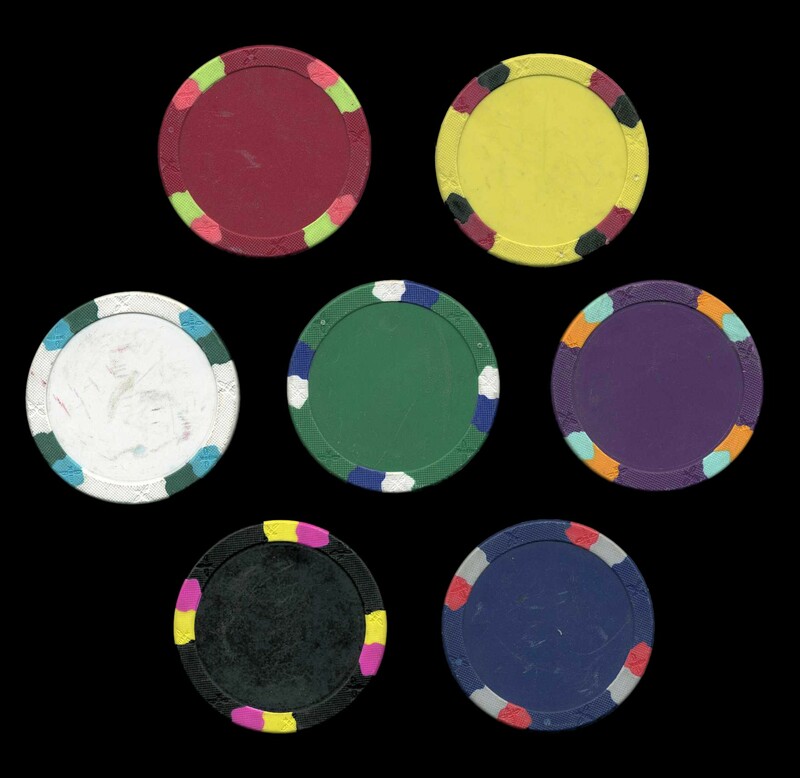 The Monaco chips have black edge stripes (the black chips have white edge stripes), and are readily distinguished when viewed edge-on. 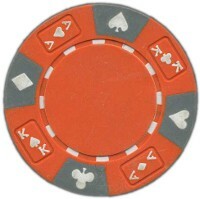 The suited chips have white dots (the white chips have blue dots) on the edge, again making the chip color easy to distinguish from a side view. 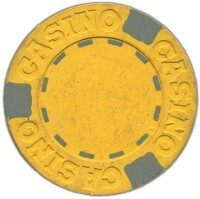 The coins produce a high-pitched metallic clang when the chips collide with each other, and the hard plastic chips are quite slippery in a stack. My primary criterion for deciding whether a chip is slippery or not is to take a small stack of about a half-dozen chips and grip it between my thumb and first two fingers. 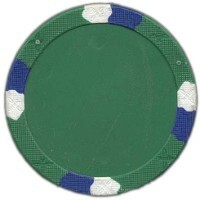 Holding the chips on edge, I slowly release the pressure on the stack. If the chips slip against my fingers and fall as a group, they are sticky enough. If the two chips against my fingers stay put but the middle of the stack slips downward, then the chips are too slippery. Repeating this test a few times readily reveals whether they always slip against each other before they slip against my fingers, always slip against my fingers first, or are about half and half on either side. 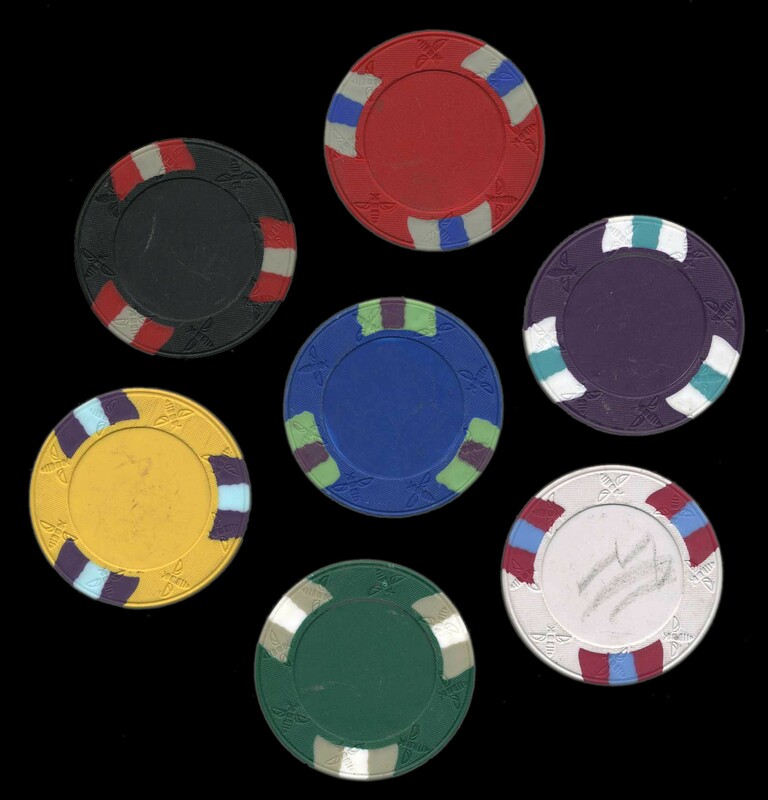 The mid-tier chips I purchased for 10-20 cents apiece are the 13 gram casino pro chips, the 14 gram ace/king suited tri-color chips, the 12 gram NEXGEN 8200 chips, and the 12 gram NEXGEN 8300 chips with larger inset area. The NEXGEN 8200 and tri-color chips contain a coin insert like the cheaper chips, but they are harder to detect due to the higher quality plastic material that surrounds the coin, and quite possibly due to the heavier weight of the chips as well. 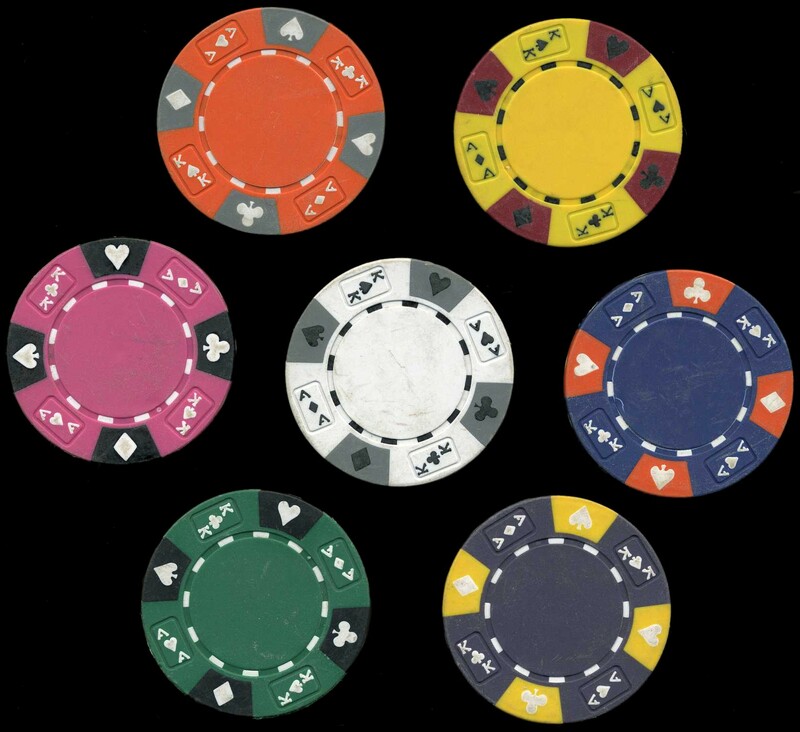 The casino pro chips are a solid composite material, and are about 1/3 cheaper than the other three, but all the ones I have seen exhibit very poor quality control in terms of moulding artifacts and uniformity of thickness. Keep this in mind if you're using chip trays: they will likely not fit well. In terms of overall feel and stickiness, casino pro chips are clearly a step above the plastic Monaco chips and their ilk. The well-made manufacturing runs are a good value for the money, but unless you're willing to purchase and return potentially quite a few to get ones made properly, I can't recommend these chips. The NEXGEN 8200 chips are the slipperiest of the lot, and too slippery in my opinion. The 8300 chip line fares much better in this regard, but the highest marks go to the ace/king chips which stick solidly together due to their greater contact surface area. 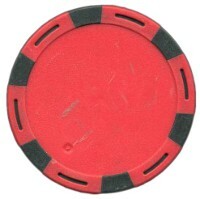 These chips do not have a recessed center to accept a sticker, so nearly the entire surface of the chip is available to hold securely to the adjacent chip in a stack. The ace/king chips though would be my clear choice in this price range: they are better made than the others in this segment and they stick together superbly. 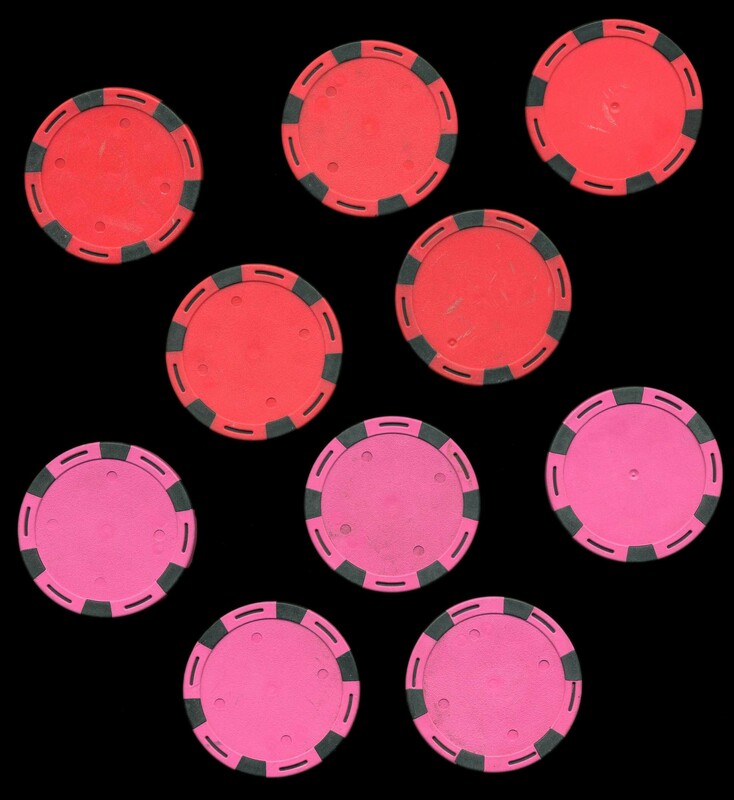 I find them visually a bit less appealing than the casino pro chips - the edge spots are larger and thus are a bit less easy to decipher - but there is otherwise no comparison between the two. The examples I bought were uniformly well made and all appeared to be the same thickness. People who dislike the graphically noisy chip faces or who want an inset sticker should consider the NEXGEN 8300 chips instead. The highest tier of chips I purchased were the 10-gram ProGen 80 chips and 10 gram ceramic chips. The ProGen chips are a traditional clay composite chip with a molded edge pattern and molded edge stripes. They accept a sticker insert but stick together well despite the reduced chip-to-chip contact area. These chips are brightly colored and generally well made but my samples had some textural problems in the sticker area, as well as a splash of hot plastic that landed in the middle of one of the faces. 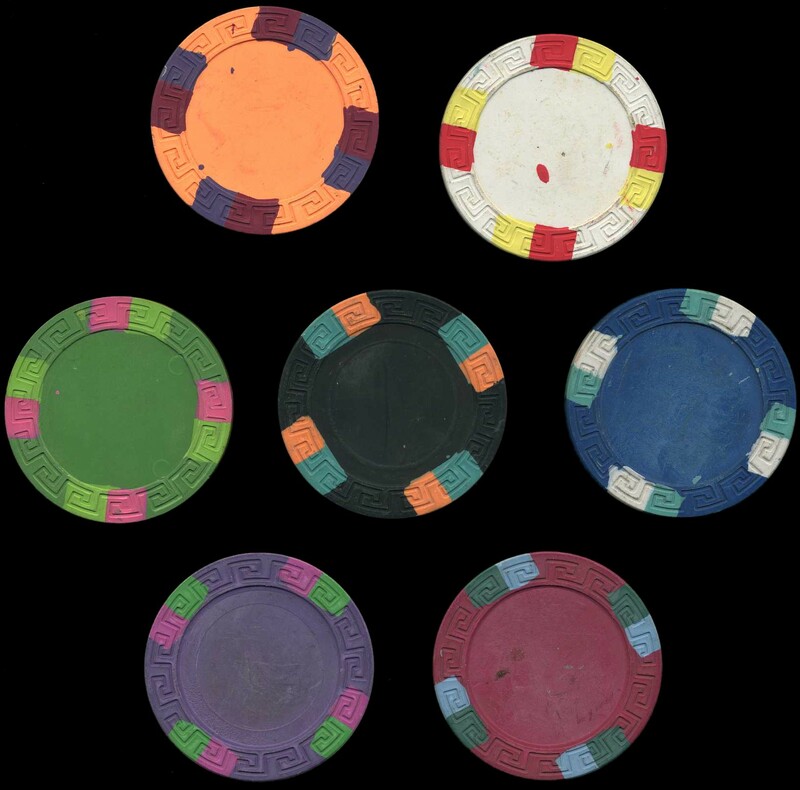 As a result of the softer material that gives these chips their nice feel, they are easy to mar and their color rubs off onto other objects quite readily. That said, they do live up to their billing in terms of having the best sound when stacked: muted and more of a 'thud' than a 'clang' in character. Ultimately however, the ceramic chips were the ones I chose. They are readily found online and can be custom printed on both faces as well as the edge with vibrant high-resolution artwork. This eliminates any issues with denominating and with edge color visibility. The stacking noise they make is slightly sharper than the ProGen chips but is not unpleasant. The chips themselves are smooth on both sides, with no molded edge pattern nor recessed sticker area. I like the flat surface, devoid of unnecessary inlays; if you like to feel some surface texture when handling your chips, then you should look elsewhere. Despite their smooth texture, these chips stick together acceptably well because the entire chip surface contacts the adjacent chip. They do occasionally slip against one another before slipping against my fingers in the slipperiness test I talked about previously, but it's a slight defect I'm willing to put up with in light of these chips' other virtues. The ceramic composite is very hard and was not marred in shipping. The manufacturers often claim that the printing process causes the colors to be impregnated into the top layer of the chip. While I did not gouge one with a razor blade to confirm that, the colors do seem to be quite durable, and did not rub off even when I tried to draw on one chip with the corner of another. Ceramic chips are available at a wide range of price points, varying from about 60 cents apiece to almost three times that, with customization charges that vary across an even wider range. By chance, I came across one of the cheaper options first. The manufacturer participates in online forums and seems credible and honest, and customers seem to be quite happy with the product. It is unclear to me what the more expensive options offer, and I will not be paying setup charges to evaluate the differing quality across the price spectrum. 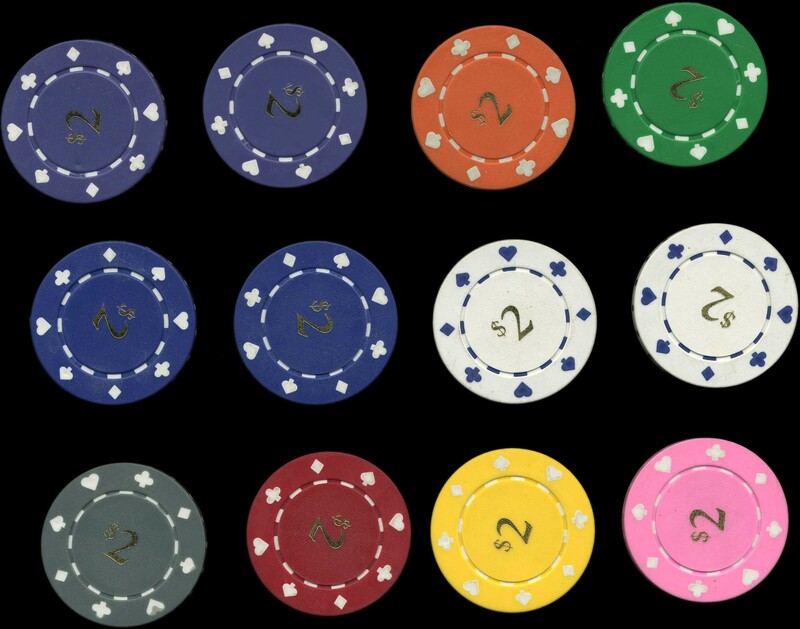 There are many varieties of ceramic chips. 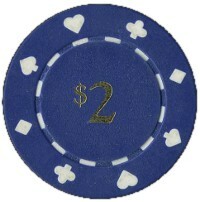 Round ones come in several different sizes, from standard poker chip size up to several inch diameter dealer button size chips. 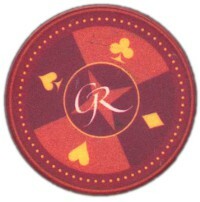 Octagonal chips are also available, as are poker plaques in various sizes. Prices seem to scale roughly in line with the amount of material in each chip. The printing process seems to still be reasonably labor-intensive and there are not substantial discounts for high volumes, as there typically are with other chip types.